Ice-Cream manufacturer Streets, have deployed Australia’s first facial recognition billboard, in a unique campaign for the Magnum brand. 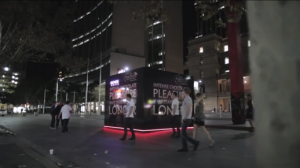 Streets initiated the campaign, though deploying a unique ‘playbox’ that ultimately intrigues individuals walking past/around the playbox. The playbox was established for 3 days, followed by an exciting and entertaining display at the end of the 3 days. This excited potential consumer about the new product, and ensured that the facial recognition board (placed after the playbox) had a preempting fan-base. After smiling at the billboard, consumers are advised to bite the ice cream, which immediately disappears. The billboard takes photos of users interacting with the installation, which are then uploaded onto the Streets’ Facebook page. This interactive installation has some unique, yet simple specifications to it. Inside the billboard is a camera that tracks the consumer/users facial expressions. The camera corresponds with the digital screen and interacts with the consumer. This is a great example of converting potentially obsolete, traditional media to a functional and immersive experience for the consumer. The campaign lives on through Facebook as users are encouraged to find and tag themselves in their photo, resulting in higher consumer engagement and opportunities for viral sharing. This campaign is a great example of how to exploit software and hardware technologies, giving marketers greater ROI on their ad spend as they watch out-of-home campaigns evolve and blossom online. Well I must say i loved reading this. That posting obtained by you is quite beneficial once and for all organizing. We’re glad you enjoyed reading this blog post! Stay tuned for further content and updates. If you would like us to publish some content on a certain topic, let us know. Happy reading! Thank you so much for providing individuals with a very marvellous chance to read articles and blog posts from here. It’s always very cool and packed with amusement for me and my office peers to visit your website at the least three times in 7 days to study the latest things you have. And lastly, we’re certainly fulfilled with all the effective suggestions you give. Some two ideas in this article are in truth the most suitable we have ever had.